While Italian babies can expect to live into their eighties, at the other end of the scale in Sierra Leone, life expectancy is just 52. 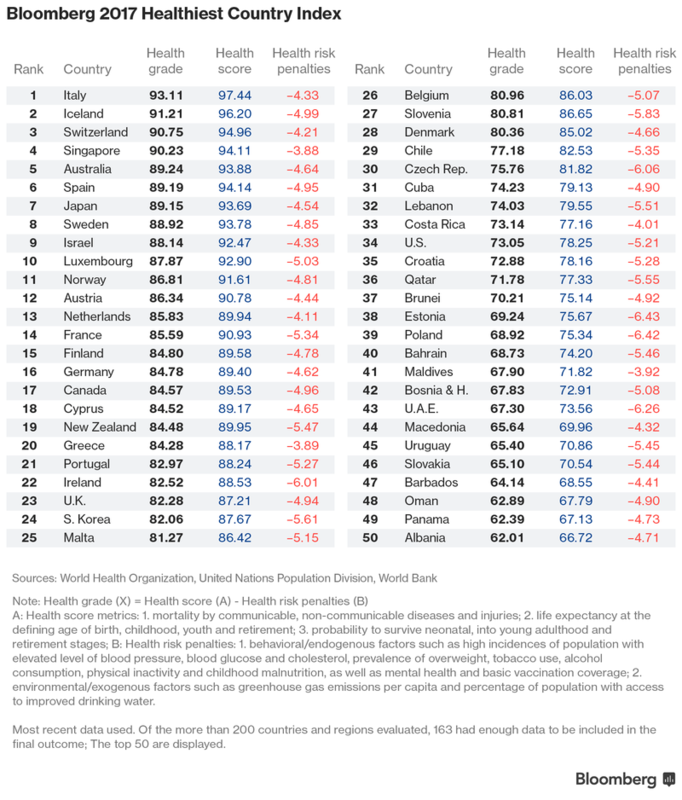 The index gave countries a ‘health score’ based on metrics such as life expectancy and causes of death, and then took into account ‘health risk penalties’. These included high blood pressure, blood glucose and cholesterol, as well as the prevalence of obesity, alcoholism, smoking and childhood malnutrition. It also considered environmental factors such as carbon emissions and access to drinking water. 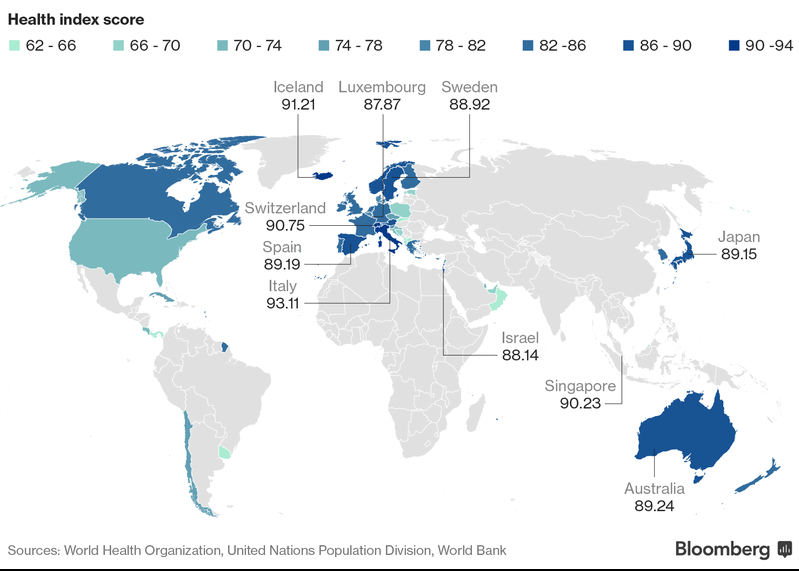 The US, which has one of the highest obesity rates in the world, is in 34th place, with a health grade of 73.05 out of 100. The key to Italy’s good health? Despite a struggling economy with low growth and high unemployment, especially among young people, Italians are in far finer fettle than Americans, Canadians and Brits, who have higher blood pressure and cholesterol and poorer mental health. Could the Mediterranean diet be a critical factor? Bloomberg notes that Italians enjoy a diet rich in fresh vegetables, fish, lean meats and olive oil, and that there’s an “excess of doctors” in the country. When it comes to living a very long, active life, scientists believe one place in Italy may hold the secret. The Cilento peninsula, south of Naples and the Amalfi Coast, has an unusually high number of sprightly centenarians. Researchers found that residents of one village, Acciaroli, where more than one in 10 of the population is over 100 years old, had remarkably good blood circulation. Though an exact reason has yet to be determined, scientists believe it could be a combination of the residents’ healthy diet based on vegetables, herbs and fish, being physically active and genetic factors that have developed over centuries.